See also category: Chamber cairns. See also category: Balanced rocks. Deutsch: Ein Steinmännchen (Steinmandl) ist ein Steingebilde als Landmarke, Wegmarkierung oder Skulptur. 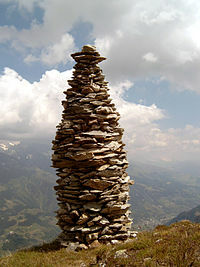 English: A cairn is a constructed stack or pile of rocks, often 'signage' for navigation-direction and place marking. Español: Un cairn es una pila de piedras que sirve para marcar el trazado de un camino o un lugar específico. También se suele llamar hito o mojón. Pages in category "Cairns (rock stack landmarks)"
Media in category "Cairns (rock stack landmarks)"
This page was last edited on 23 November 2018, at 14:45.